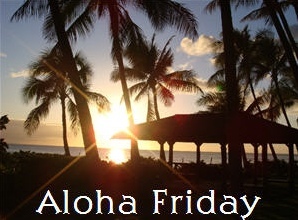 Aloha Friday is sponsored by Kailani at An Island Life. Friday is a day when they take it easy, so I'm posting a simple question that doesn't require a lengthy response. You can participate, too, by posting a question on your blog and linking it here. Grocery shopping is the bane of my existence! Next to that, it would be making lunches. What about you? What required task do you dislike most? I HATE doing dishes and cleaning the bathroom, everything else is fine. I love grocery shopping! Cleaning the bathroom is a horrendous chore. Without a doubt, it's ironing. I just hate to iron my hubby's dress shirts, all those sleeves and angles. Drives me nuts! Laundry! I hate doing laundry, maybe because of 8 people there is so much laundry. Never ending laundry or maybe because the laundry room is in a closet in my bedroom, so forever am I reminded of laundry. I get tired of cooking. By the time I finish cleaning up from breakfast, it's time to start something for lunch. It is just an endless cycle! It would absolutely have to be the cat box!